The inherent ambience of Pondy, as Pondicherry is fondly called, becomes most evident in the oldest part of the town, which flanks the seashore boulevard. Colonial buildings, some which trace back to the 18th century, line along a grid of straight clean streets and house that French institutions, private homes and business centre and of course the sprawling building of the famous Sri Aurobindo Ashram. But Pondu has its own special attraction to offer. It is a perfect base to explore the rich destinations around it. Pondicherry is a former French Colony which was settled in the 18th century.The Union Territory of Pondicherry consists of four areas: Pondicherry, Mahe, Karaikal and Yanam. According to history Pondicherry was the capital of French before Independence. Also there are evidences for a Roman settlement here nearly 2,000 years ago. 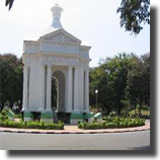 Pondicherry has also witnessed lot of battle between the British and the French. It was finally ceded to the Indian federation in 1962, after a long movement that demanded union with India. 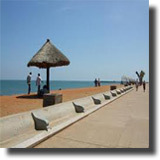 The main settlement of Pondicherry is situated on the Bay of Bengal, 197 kms South-east of Chennai. Karaikal is in Thanjavur, Mahe is a pocket in Kerala and Yanam is in East Godavari district of Andhra Pradesh. 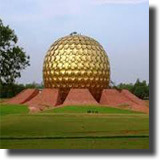 Pondicherry is well known as the seat of Sri Aurobindo and the Mother. The present name comes form "Pudu cherri" or "New Village", but its ancient name was Vedapuri suggesting that the place was meant for Vedic learning. Though the French have left its territory it still has the French -connection flavor in its life. Pondicherry has one of the finest beach promenades in the country. The city presents an unusual combination of European culture and Indian traditions. French style buildings, parks, Ashram atmosphere in the Auroville region and a handful of good hotels make it a pleasant tourist destination. Pondicherry is situated at a distance of about 160 kms south of Chennai on the Coromandel coast.Pondicherry is surrounded by Bay of Bengal on East, and on the other sides are the South Arcot District of Tamilnadu. The best time to visit Pondicherry is between the months of September and March. Like any other place in India Pondicherry has its own unique with its own colourful ambience like the International Yoga Festival in January, Maasi Magam in February-March at the beach of the fishing village and Fete de Pondicherry in August. Pongal- this festival is celebrated in Janaury as a harvest festival by the agricultural community. Houses are cleaned, cattle are washed and special feasts are enjoyed on this day. International Yoga Festival- this festival in Janaury gathers an international community on yoga. Seminars, shows and practices are conducted. Maasi Magam- this festival in March is celebrated by the village of Kuruchikuppam near Pondicherry. Deities from some 38 villages are brought to Pondicherry in a musical procession and then they are immersed in the sea. Mangani- Celebrated in July as a mark of respect for Karaikal Ammaiyar in Karaikal , a part of Pondicherry. Important events from the life of the Ammaiyar are enacted. Later a procession of the Shiva Idol is taken and pilgrims throw mango fruits over it. Bastille Day- This Indo -French Pageantry is held on July 14th. Uniformed war veterans march through the streets singing the Marseillaise. Fete De Pondicherry- this takes place from 15th to 17th of August. This is a cultural pageant coinciding with the Liberation day and the Independence Day. The Park Monument is brilliantly decorated with lights for the function. Sri Aurobindo was born in Kolkata and had his education in England. Following a mystic inspiration he came to Pondicherry in 1910.He was a yogi. He made a synthesis of the various Yoga principles and called them the integral Yoga. Later Sri Aurobindo grew with the arrival of Mother, a French by birth in 1920. Aurobindo founded the Ashram in 1926 and it is one of the most sought after by the westerners and the affluent today. 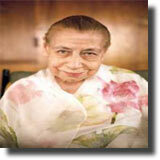 After Aurobindo's death in 1950, the Mother was the sole guide for the Ashram till her death in 1973. The Ashram hums with activities, as work is an offering to the ashramites to the Divine. The main building comprises the houses of Shri Aurobindo and the Mother. In the courtyard are the samadhis of Aurobindho and The Mother where their mortal remains have been enshrined. Visitors are allowed to visit the samadhi between 8am and 6pm everyday. The other places of interest in the ashram complexes are the International Education centre, guesthouses, libraries and the cottage industries. Samadhi of Sri Aurobindo and Mother- this is in the main premises of the Ashram, where Aurobindo and the Mother lived. The Samadhi is always decorated with flowers in charming patterns. It is nice place for meditation. The Mother's birthday and Sri Aurobindo's birthday are known as Darshan days when people visit the ashram and seek their blessings. Sri Aurobindo International Centre of Education - It is a wing of the ashram where education is imparted keeping the integral development of the student in view. The classes are from Kindergarten to Higher Courses. Cottage Industries - Hand-made paper, perfumes, incense sticks, embroidery, batik, marble works are the different types of cottage works involved by the Ashram inmates. The 1500 metre long beach that borders the town on the side is clean and is an ideal place for swimming and sun bathing. There are two monuments of historical importance on the beach. One is the 4 metre tall statue of Mahatma Gandhi and the other is the War Memorial, built by the French in commemoration of the soldiers who died in the First World War. The Light House which stands 29mt. high is further down the beach and is nearly 150 years old. Situated on Dumas street, the renowned French Indologist Dr.J.Fillozet established this internationally acclaimed institute in 1995.The institute conducts research in arts and science and is perhaps the only permanent link with France in Pondicherry. 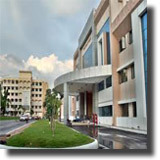 This is one of the foremost medical institutions in the country.JIPMER which is short form of Jawaharlal Institute of Post Graduate Medical Education and Research was established long back and is one of the most prestigious institutions of its kind in the country. Just off West Boulevard, the gardens planned by C.S.Perrotet in 1826, it is a well-maintained exhibition of rich flora and have a good collection of exotic flowering plants from India and abroad. The gardens are near the sacred heart Church. There is also an aquarium here.It is open from 10am to5 pm, from Tuesday to Sudnay. The Museum of Pondicherry is on the Romain Rolland Road and it displays some fine archaeological finds Opened in 1984, this museum has on display some fine antiques apart from sections devoted to archeology, geology, sculpture, handicrafts, and objects of art, paintngs and armaments. There are number of Churches that are worth visiting and one of the most beautiful is the Church of the Sacred Hearts of Jesus located on South Boulevard. It is built in the Gothic style and has three stained glass panels in a corridor behind the altar, which depicts the life of Christ. The Eglise de Notre Dame de Lourdes is situated in Villiyanur on the outskirts of Pondicherry is built on the same pattern as the Basilica at Lourdes in France. The Villianur temple of the 12 th century Lord Tirukameswara, the Tiruvandar temple of Lord Shiva with sculptures of the 7th century, the Manakula Vinayagar temple for Lord Ganesha, the Vedapuriswara temple for Lord Shiva are the temples worth mentioning. The Varadharaja temple, built sometime in the 12th century, has inscriptions which tell of a Sanskrit University that existed at Thirubhuvanam.The Manakula Vinayaka temple is also very popular with both the locals and visitors for it is believed that Lord Ganapathy, the presiding deity, favours his devotees with success in whatever they do. 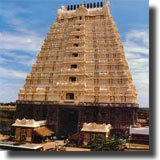 The Thirukameshwarar temple in Villiyanur was built during the 12th century and dedicated to Lord Shiva. Thousands of pilgrims visit this temple during its annual car festival held in May-June. The backwater and lush greenery on both sides of the river Chunnambar which is 8kms from Pondicherry is an ideal setting for boating. Along the borders of Tamilnadu and Pondicherry, 10kms from Pondicherry is this township meant for people aspiring for a higher goal in life. It was the brainchild of The Mother and was designed by the French Architect, Roger Anger. The foundation for it was laid in 1968.It is said that the opening ceremony of the project was attended by Representatives from 121 countries. Sponsored by Sri Aurobindo Society, the township has done commendable experiments in collective living, agriculture, gardening and many other useful fields. The project has 70 settlements spread over 20kms and about 1200 residents including many foreigners. Accommodation is available at the guest house. Matri Mandir is the physical and spiritual center for the Auroville. The meditation chamber here is lined with white marbles and houses a huge solid glass sphere. Suns rays are beamed into this sphere from a tracking mirror on the roof. Auroville can be reached from the coast road at the village of Chinna Mudaliar Chavadi. It can also be entered from the main Pondicherry to Chennai road at Promese. Karaikal - this is situated on one of the estuaries of the river Cauvery in Thanjavur. It has a temple for Jataeswaraswami. A festival is held here every year in honor of Jayatsu, the eagle who tried to save Sita form Ravana on the way to Sri Lanka. 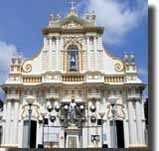 Mahe - This part in Kerala has a shrine dedicated to St. Teresa of Avila, built in 1736. It is the oldest Catholic Church in the Malabar region. The local Muslims, Hindus and Christians join together and are maintaining this Church. Light House- this abandoned light house is 5kms form Pondicherry. It stands on the Red hills, west of the city and 29 meters above sea level. The light- house was replaced by a new one in 1979. Arikamedu- this historical site is 4kms form Pondicherry. It has ruins that tell that the Romans traded with Indians in the 2nd century B.C. Ruins of the 18th century house of the French Jeusit Mission are also here. For the shoppers Pondy has a lot to offer and is fast becoming a favourite shopping destination of the southern metropolitan cities.Pondy s soft on your purse with taxes low or non existent. It is known for its traditional doll making and textiles and silks. 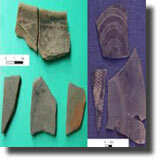 But it is also the birthplace of several world class brands in leather, pottery, aromatics, fashion and handmade paper. These excellent products came to renown solely by their superb quality. A new trend is the proliferation of exquisite decor boutiques and export quality antique furniture galleries. Rice is the staple food in Pondicherry. Being a coastal town, Pondicherry has lots of fish dishes. The French cuisine is also available for the asking. There are good Chinese, Chettinad, South Indian, North Indian and French Cuisines along the Beach Road. Old No.36, Vysial Street, Pondicherry - 605 001. Pondicherry does not have any airport with in its boundary. But it lies very close to Chennai, which has an international airport. Chennai is accessible from all over the country. Almost all public and private airlines operate regular flights to and from Chennai. The East Coast Highway is one of the best routes to Pondicherry from Chennai. The 163 kms travel passes through the coastal line and some important amusement parks like those of VGP, MGM, etc are on the way. There are frequent buses to Pondicherry from Chennai and Villupuram. There are two main bus stands in Pondicherry, the State Express Bus stand and the General bus stand both ,located close to each other downtown. A good road network, originating from National Highway 45, covers Pondicherry. The most convenient way to Pondicherry is either from Chennai (150kms) and Bangalore (320kms). The nearest railhead is Villupuram (36 kms), which is connected to Chennai and Madurai / Trivandrum. One can also take a train from Bangalore to Cuddalore and then reach Pondicherry by road.